The New American Bible is the most widely used Catholic Bible version in the United States today. The Weekday and Sunday Mass readings are taken from the NAB version, and the U.S. Bishops have endorsed it for use in church and school religious-education programs across the country. 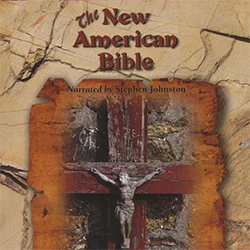 With over 80 hours of narration and synchronized on-screen graphics and text, the NAB New & Old Testaments on MP3 features Emmy Award-winning narrator Stephen Johnson. His crystal clear mellow baritone voice provides distinct pronunciation, and makes the Scriptures come alive in an easy-to-understand style. Stephen Johnston has narrated and sold more translations of the Bible than any other person in history. He graduated from college with a BA in Radio and Television, and planned to become a news announcer. In 1976 he was approached about narrating the New Testament on cassette. Plays on computers, iPods, MP3 players, iTunes, iPads and all other tablets and smartphones that play MP3 files.